I’ve started quilting my Parcheesie quilt by stitching in the ditch. The new generation thinks this is old fashioned and I thought so too until I took a course on free motion quilting. When you free motion quilt, wash and dry your work, your piecing becomes distorted, the FMQ is more prominent and the piecing can get lost. Stitching in the ditch prevents your hard work from becoming skewed. In fact, it’s also recommend that you stitch around the perimeter of your quilt prior to FMQ so the edges of your quilt don’t become wavy. If you’ve never tried these methods, give them a whirl and witness for yourself, the difference these techniques make. This has really solved some common problems for me, especially the wavy edges. In the case of my Parcheesie quilt, I want the piecing to be dominant, not the quilting, because it was a lot of work and I really love it! In summary, stitching in the ditch isn’t a style choice but rather a practical choice, IMO. On another note, everyone has been raving about Aurifil for the past year or so and I have to admit that I love it too but it’s just not available at my local quilt shops. Aurifil has done an excellent job of using social media to boost their profile and increase sales. Superior Threads, however, are available at the quilt shops around me. 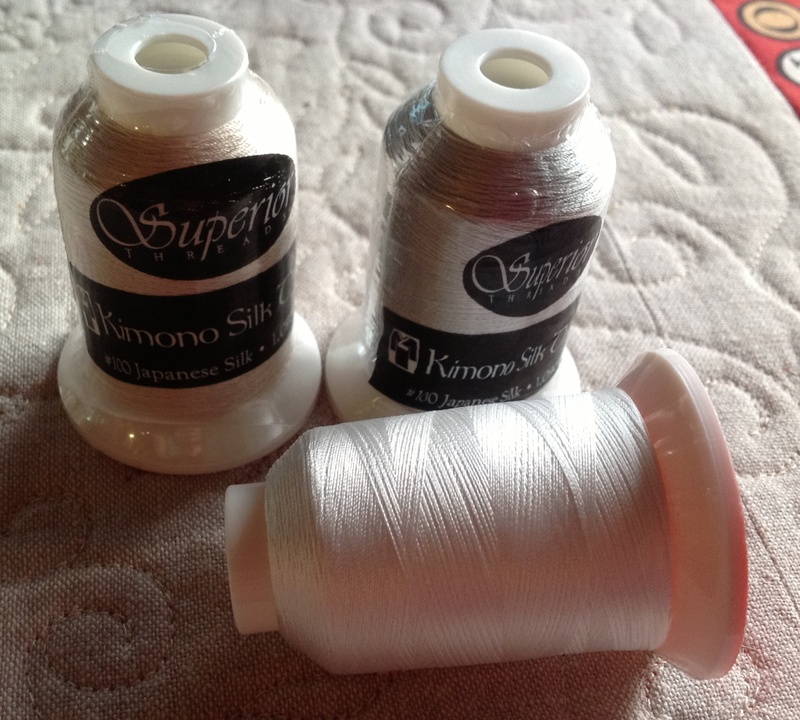 I recently purchased three spools of Kimono Silk; beige, white and light grey, the basics. It’s very fine and extraordinarily strong — more so than cotton, and great for stitching in the ditch because you don’t notice the stitches, it’s like a filament thread but a natural fibre, a great alternative to nylon (ew). 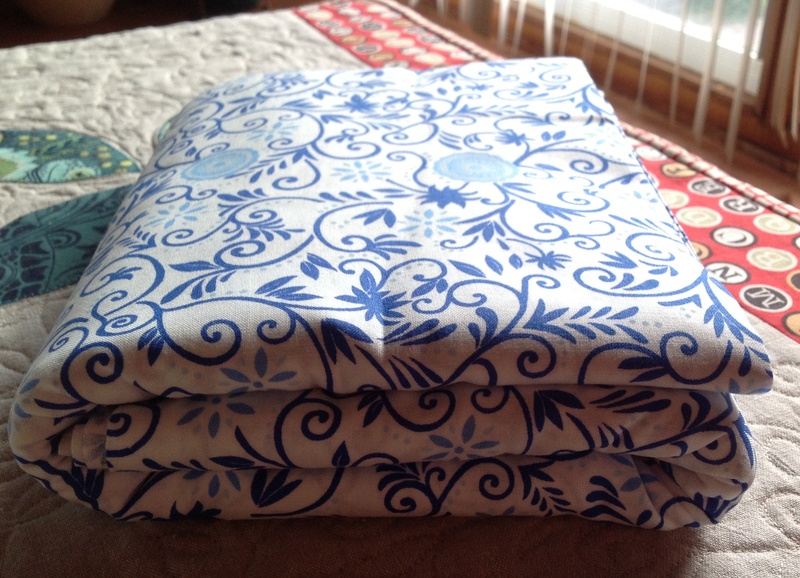 Lastly, I FINALLY received the backing fabric for my “Les Fleurs Bleu” quilt, I can’t believe it! I can’t wait to start quilting it — very simply, outlining the flowers I think, still undecided. Sadly I had to pay an additional $25.00 for customs on top of the shipping charges. I hate customs, it’s so random and unfair! On the other hand, The Fat Quarter Shop reduced my shipping fees from $26.00 to $13.00, YAY and thank you FQS!!! This entry was posted in Fabric, FMQ, quilt, Quilting, Thread and tagged Aurifil, Deb Strain, free motion quilting, Spa Fabric, Superior Threads by Tabatha. Bookmark the permalink.